Primary Ciliary Dyskinesia (PCD) is a rare, inherited respiratory disorder which basically affects the ‘cilia’ --- the small, hair-like structures lining the airways. This disorder is also known by some other names, including Immotile cilia syndrome, Acilia syndrome, and Dyskinetic cilia syndrome. Since Primary Ciliary Dyskinesia is an inherited disease, it gets passed from the parents to the children through genes, in a very complex process. Usually, children affected by the disorder inherit faulty genes from both parents. The ‘cilia’ structures which get affected in Primary Ciliary Dyskinesia have a wave-like movement, and carry the mucus -- a slimy substance containing inhaled dust, bacteria, and other small particles -- towards the mouth, so that it can be eliminated from the body through cough or sneezing. The inherited faulty genes which get transmitted from parents to children causing Primary Ciliary Dyskinesia are primarily associated with the growth and functioning of the cilia. Due to the faulty genes, the size or shape of the cilia may be wrong, or the movement of cilia may be incorrect. In some cases, the cilia may be completely missing. Any imperfections in the cilia -- or its absence altogether -- allow bacteria to stay in the airways; thereby leading to breathing difficulties, infections, and several other problems. 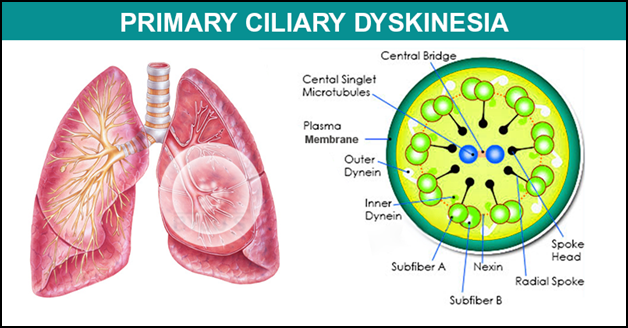 The common symptoms of Primary Ciliary Dyskinesia are mostly different into two categories --- (i) symptoms which involve the ears, sinuses and lungs; and (ii) symptoms which involve organs outside the respiratory tract. Sinusitis or thick nasal drainage. An early diagnosis as well as proper and timely treatment is very crucial for the patients suffering from Primary Ciliary Dyskinesia. After a correct diagnosis of the condition, its proper treatment can keep that the patients’ airways and lungs healthy; thereby preventing or delaying potential lung damage. 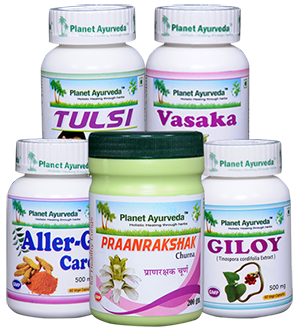 For managing PCD symptoms in a safe and natural manner, Planet Ayurveda herbal manufacturing company offers some excellent herbal formulations, which have been prepared under the guidance of renowned Ayurveda experts. For preparing these formulations, 100% pure and natural herbs are used. This product is an extremely beneficial herbal powder prepared from several herbs which have proven anti-allergy properties. These herbs include Bharangi (Clerodandrum serratum), Kantakari (Solanum xanthocarpum), Anantmool (Tylphora asthmatica), Mulethi (Glycyrrhiza glabra), Shirish (Albezzia lebbock), Dalchini (Cinnamomum zeylanica), and Vaasa (Adhatoda vasica). The use of this churna is helpful in treating chronic allergies, chronic bronchitis, asthma, and respiratory tract infections. PCD patients can benefit from this churna because of the ability of its herbal ingredients to enhance the health of the respiratory system, maintain healthy functioning of lungs, treat breathing disorders, and cure cough, asthma, chronic sinusitis and chronic rhinitis. Dosage of Praanrakshak churna recommended for PCD patients: One teaspoon of the churna, three times a day, with plain water, after meals. The standardized extract of pure ‘Adhatoda vasika’ herb (Malabur Nut) is used for the preparation of these capsules. The herb has proven anti-fungal and anti-bacterial properties; and it is widely used in herbal formulations because of its anti-asthmatic, anti-dyspepsia, uterotonic, and bronchodilatory actions. The benefits of the use of these capsules include their capability to support healthy lungs, keep the intestines healthy, boost the immune system, treat diarrhoea and dysentery, treat inflammatory swellings, and manage skin problems. Dosage of Vasaka capsules recommended for PCD patients: 1-2 capsules with plain water, two times a day, after meals. For preparing this amazing herbal formulation, pure and natural herbal extract of the potent ‘Giloy’ herb (Tinospora cordifolia) is used. The herb is widely known in Ayurveda because of its anti-inflammatory, antioxidant, immune-modulator, anti-cancer, and antipyretic actions. The use of these capsules is very helpful in treating different kinds of cancers, giving the body strength to fight infections, treating chronic fever, managing several skin disorders, treating anaemia, boosting immunity, and managing gout and cardiac debility. Dosage of Giloy capsules recommended for PCD patients: 1-2 capsules with plain water, two times daily. To prepare these capsules, standardized extract of ‘Tulsi’ herb (Ocimum sanctum) herb is used. Tulsi is known for its immune-modulating properties, and it has proven capability to treat different types of allergies, auto-immune disorders, cancers, skin problems, chronic sinusitis, and chronic rhinitis. The use of Tulsi capsules is beneficial for PCD patients because of the ability of the product to improve immunity, rejuvenate the pancreas, and reduce the adverse impact of environmental toxins. In addition, these capsules can also provide the body with sufficient amounts of calcium, Vitamin A, Vitamin C, and bioavailable antioxidants. Dosage of Tulsi capsules recommended for PCD patients: 1-2 capsules twice a day, with plain water after meals. Some well-known anti-allergy and anti-inflammatory herbs are combined for the preparation of these capsules which are capable of treating the common symptoms of allergy. The herbs used for preparing these capsules include: Ashwagandha (Withania somnifera), Haridra (Turmeric Rhizome - Curcuma Longa), Shirish (Albezzia lebbock), and Neem (Azadirachta Indica). PCD patients can benefit for the use of these capsules as they are helpful in stabilizing allergic reactions, relieving chronic allergies, reducing pain and inflammation, strengthening the immune system, nourishing the body, and removing toxins from the body. More specifically, these capsules are a wonderful supplement for healthy lungs because they can treat sinusitis, rhinitis, sneezing, and asthma. Dosage of Aller-G Care capsules recommended for PCD patients: 2 capsules with plain water, two times a day, after meals. The above-mentioned herbal products have the ability to effectively manage the symptoms of Primary Ciliary Dyskinesia. These products are safe to use because they do not contain any chemicals, preservatives, starch, yeast, artificial colors, binders, fillers or additives.